A thorough drenching once or twice a week is better than a light daily sprinkling. Deep watering encourages healthy root systems to flourish. Allow your lawn to dry out between waterings and send the roots downward in search of water. Clay-based soil is heavy and absorbs water more slowly, but retains it longer. Clay soil also compacts more easily. This forces roots closer to the surface while looking for room to grow, leaving them vulnerable to drought. Early mornings are the best time to water, when cooler air and minimal wind results in less evaporation. 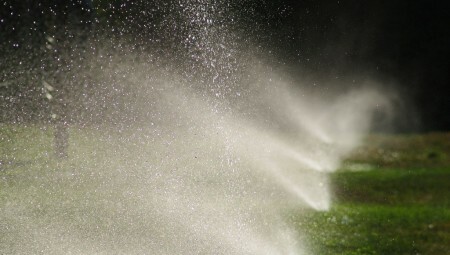 Nighttime watering isn’t recommended mainly because the grass stays wet until after the sun rises – an invitation to disease. Even coverage over the entire area is important to maintain a healthy lawn. To determine how well your irrigation system is working, place several shallow containers (empty cat food cans, etc) throughout area being watered and note the differences, then adjust circuit duration accordingly. Aerate your lawn at least annually to loosen compacted soil and improve water penetration.